The buzz about Baltimore’s Open Walls public mural project is moving from art blogs to the mainstream media, including a new report by the Voice of America produced for foreign audiences. 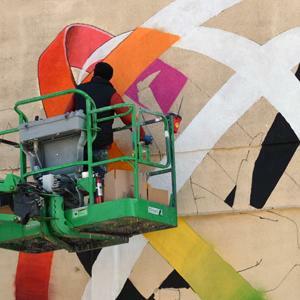 The VOA today posted a video featuring interviews with Baltimore street artist Gaia, Station North district executive director Ben Stone and artists from Ukraine and South Africa. 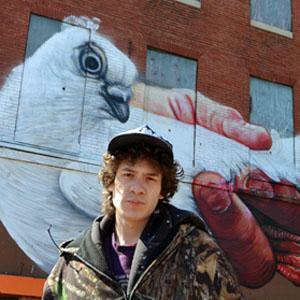 Only about half of the more than 20 planned murals have been completed, Stone said, but he estimates that tens of thousands of people already have seen Gaia’s hand holding a pigeon at the corner of North Avenue and Charles, along with about 10 other completed works. Stone says a few hours after he posts photos of newly completed mural projects on the Web, they are picked up by a dozen others. “It’s very exciting,” he says. Baltimore is increasingly looking to its growing arts community to help it grow, especially in neighborhoods like the ones in and around Station North, which are pockmarked with neglected properties. “The city for better or for worse is a canvas, because we have 45,000 abandon buildings in this metropolitan area,” Gaia tells VOA. An artists’ reception for Open Walls and Whoop Dee Doo will be held Saturday at the Cork Gallery, 302 E. Federal Street, starting at 6 p.m. The project is expected to be completed by May 25. For more arts and culture events, see the Brew’s new Coming at You page.